Long before you get a box or folder of material in an archives, an archivist was hard at work performing a long list of tasks required to ensure there is access to the material. Archivists have a very specific set of skills that help them to maintain stewardship over the collections for which they are responsible. That word - stewardship -- is particularly descriptive of what both archivists and family historians/genealogists do: Both groups have the responsibility of taking care of the physical remnants of history, making it available for generations to come. You, as a family historian or genealogist, can apply the components of an archivist's job to how you care for and handle your own collection of family history materials. The Society of American Archivists and Richard Pearce-Moses define an archivist as "An individual responsible for appraising, acquiring, arranging, describing, preserving, and providing access to records of enduring value, according to the principles of provenance, original order, and collective control to protect the materials' authenticity and context." In essence, archivists select, arrange and describe, care for, and make accessible the materials over which we have stewardship. Sound familiar? The principles under which archivists do this job are, perhaps, the subjects for later discussion. However, the key to remember is that whether you're an archivist or a genealogist you want to ensure that neither the physical material nor the information that it contains ever comes to harm and that the material is accessible for ourselves and other researchers. I'll break down the components of an archivist's job so that you can apply these functions to your own family history materials. At all times, our focus is to preserve the information within the material we steward so it is not lost. Please see my article, "What Do I Do With All of This Stuff: The Process of Processing" for information on how to start getting your own materials in order. 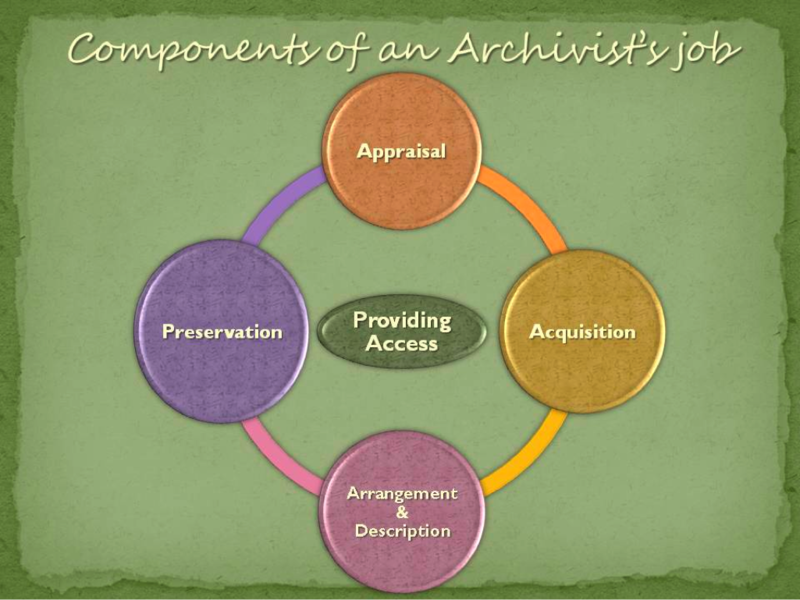 An archivist's job can be broken down into five components: appraisal, acquisition, arrangement and description, preservation, and providing access. At its core, the archivist's job is to make the material in his or her collections accessible, both physically and intellectually. The remaining four components are dependent on one another; without any one of them, the job is incomplete. You can think of these components in a circular fashion because at any point in time there will be material in the archives that are in each state. It's also possible that a single item, be it a box, folder or document/photo, might go through each state more than once. Let's take a deeper look at each component and how it applies to your own collection, using a fictional archives as an example. I will use a small historical society collection as an example of how each of the components of an archivist's job works. An archivist has been asked to create the Our Town Archives from material the town has in its possession. The archivist will work with individuals under whose responsibility the archives fall to create a collection policy that outlines its purpose and the material that it will and will not retain.­ In the case of Our Town Archives, the collection is meant to capture the history of the town, its origins, the people who lived there, businesses and social groups, etc. It is an open collection, meaning that additions to it are welcome. The collection policy creates the framework for the archivist to begin looking at the current material and will serve as a guide to accepting new material in the future. For the family historian, creating a "Collection Policy" might seem strange and yet, do you really need a copy of your great aunt's third husband's uncle's birth certificate? Well, depending on your physical space and the focus of your research, you might. But, there's also a good chance that the research has pulled you down a line that doesn't really need your focus, and having a general "policy" about what materials you'll keep can be helpful. It doesn't require a lot; it can be as simple "I will collect materials on my direct lines only" or "I will collect materials directly linked to my family, including siblings and their spouses, but not spouse's collateral family." Of course, the choice is yours, but having a general framework in mind will help to avoid time spent locating materials not really intended for your own collection as well as help you keep the quantity of your materials manageable. While "Antiques Roadshow," "American Pickers," or "Auction Hunters" might pop into your mind when the term appraisal comes up, for both archives and ourselves the term has a deeper meaning than just dollars and cents. Monetary value is an aspect of it, but at the heart of appraisal is the why behind something being part of a collection. In the case of the Our Town Archives, the collection policy is fairly liberal, as most of our own would be. As the material is reviewed, the archivist must look broadly at whether the item(s) contain information that falls within the context of the history of the town as defined by the collection policy. One of the first things s/he finds are boxes of magazines with articles about the town. They were carefully put in chronological order and the pages that the articles are on are marked with paper slips. There are four large boxes of these magazines. The questions the archivist must answer are: Is this material unique? Are they copies of a magazine produced in extremely limited quantity, or are they perhaps available through another source such as a library or on-line periodical resource? What is the quality of the information in the articles? Are they first person interviews of original residents, or are they informational articles of content from other sources? In this case, they are simply magazines from a state organization that compiled information from other readily available sources. The appraisal on this material is low within the context of the collection, and the boxes are marked for disposal. Yes, disposal. I suspect that many of you recoil at the thought of letting go of any of your material. However space is often limited and so honing the skill of culling material from collections is very important. Again, the key is whether or not the material is available in another form, from another resource, or falls within the limits of the Collection Policy. The quality of the information that the material holds is also important to its appraisal value. Is that information from a primary (first person) source or compiled from other resources? Let's look at some newspapers that the archivist found next. There are two groups of newspapers: one is clearly contemporary (within the last 30 years) and the other are very large newspapers that are brownish yellow and very fragile. Those are still folded in half as they were when they were received. The dates show they are from the late 1860s to the late 1870s. Upon very gentle examination, it appears each paper is only a few pages in length but has columns of local information that includes some vital information such as birth, marriage and death notices, as well as business notices and social gatherings. After investigation, the archivist determines that the newspaper was printed locally, was published from the late 1860s to the late 1870s, and that none of the local, regional, or state repositories have copies. It appears that these newspapers are the only copies in existence. It's an easy call for the archivist. The appraisal value on these newspapers is very high. In contrast, the contemporary newspapers are available both on microfilm at the local library and through the newspaper itself on-line. These can be culled as the information is neither unique nor scarcely available. Now, take a look at your own material, using an archivist's eye. Take any random item from the materials you have collected and appraise it. Does it fall within your collection policy? Is the information in that item unique like the one-of-a-kind newspapers? Is it something you have in multiple copies or formats? What is the appraisal value that you can apply to that item beyond the value you put on it when you saved it? Appraising your materials as an archivist would will help you keep your collection manageable and, ultimately, will help you find information when you need it.